[Image: Gentlemen quarriers of a golden age, via]. Following on from earlier looks at the city as mining district, including a quarry on the Lower East Side, I was interested to read that parts of Manhattan were once productive marble quarries. A street and surrounding small neighborhood called Kingsbridge, in particular, was "an early quarrying district on Manhattan island." 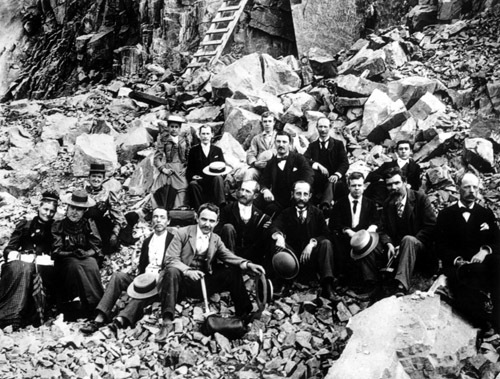 In a 1997 article for the Mineralogical Record, Lawrence H. Conklin relates his discovery, like something out of Jules Verne, of a 19th-century print called "Marble Quarry, Kingsbridge, N.Y. (1819)," thus piquing his interest in these and other excavations around Manhattan's northern end. "The acquisition of the drawing spurred me to explore the printed record," Conklin writes, "to find out what could be learned about marble and mineral specimen production at Kingsbridge, and especially about the quarry and the house depicted in the sketch." 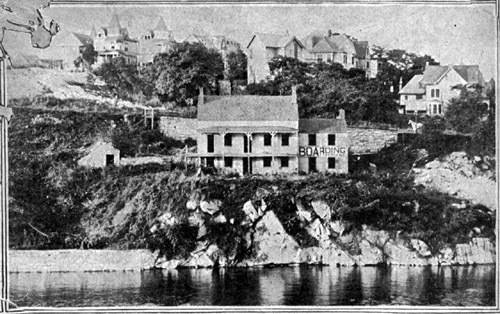 [Image: A quarry site that now "lies in the bed of the present Harlem River," via]. "From 213th to 217th street the road [called at the time the Kingsbridge road and now known as Broadway] passed along the foot of the eastern slope of marble quarries." This places additional marble quarries in Kingsbridge, in the year 1808, on the lands of the Dyckman family and elsewhere. The Dyckmans at one time owned the largest single tract of land in the history of Manhattan and were honored by the naming of present-day Dyckman Street, an important east-west thoroughfare that traverses their former lands. When the quarries were later abandoned, they filled with water, becoming ponds (and, in the winter, small ice-skating rinks); however, in many cases, these already coastal land features were "obliterated" by the navigable straightening of the Harlem River. [Image: Nautical chart of the Harlem River, courtesy of NOAA]. But there are other quarries out there that have since been built over, and that remain covered over or filled in by architecture. There might even have been, Conklin speculates, a large-yielding quarry "situated on land that is now occupied by Columbia University's Baker Field." It's fascinating to consider even the possibility that there are buildings on the northern end of Manhattan whose basements are, in fact, former quarries, large artificial caverns hewn directly from bedrock, negative sculptures in which people now do laundry or park cars (or, who knows, wander around at night for hours, flashlight in hand, amazed at these labyrinths that stretch for miles, across state lines, underneath rivers, out beneath the sea). The story of the quarries is long, as the same veins of rock that criss-cross Manhattan were also exploited further afield, at sites in Connecticut and upriver, and, if you're into that sort of thing, it's worth a quick read. Finally, though, there is a juxtaposition of two historical photographs in Conklin's post that I feel compelled to reproduce here; it's like Piranesi-on-Hudson—or on 216th Street, as the case may be. 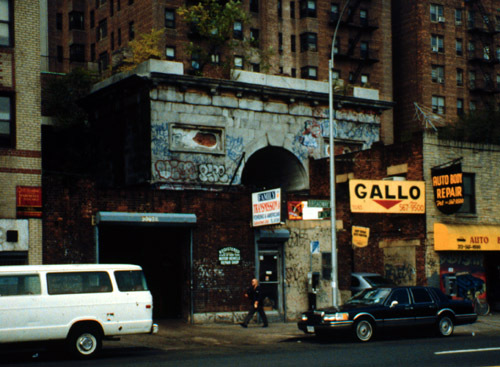 A ruined arch made from quarried Manhattan bedrock later covered in signs and spraypaint, all but buried in the visual mess of the modern city. (More on the minerals of NYC). Brilliant ending but the arch needs its own post! I used to live right next to that and always wondered what it was about...thanks. would make an intesesting and appropriate post/article. 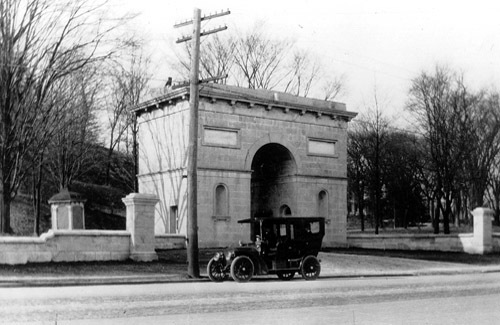 That arch has nothing directly to do with the quarries other than that it may have been built of their product. It was in fact once the entrance to a game reserve. New Yorkers would venture to the northern end of Manhattan in order to bag themselves a deer.